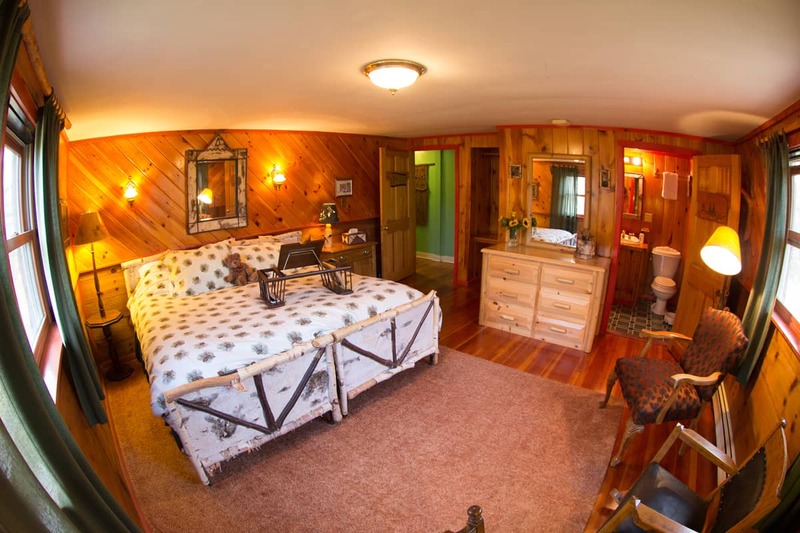 Within our 1886 Lodge are three guest rooms, all with private baths and unique personalities. Lovingly named Pine, Birch, and Canopy, they are symbolic of our unique Old World and Adirondack ambience that is representative of our Adirondack Alps experience. More of an inn than a restaurant with its limited seating, reservation only, Great Camp Dining experience, you have the additional benefit where your room is an entire Lodge. Relax in the Lobby with fireplace, which used to be a post-office and trading post in the 1800s. Or, meander further down to the Fireside Rathskeller with the USA TODAY featured beer cellar which used to be a 1920s Speakeasy. Your room also extends to all 25 acres of the estate with nature trails, incredible beach and opportunity to take a lantern-lit sleigh, a bike ride, or a cross-country ski or snowshoe. Bundle your room with one of our discovery packages and save on your lodging rate! 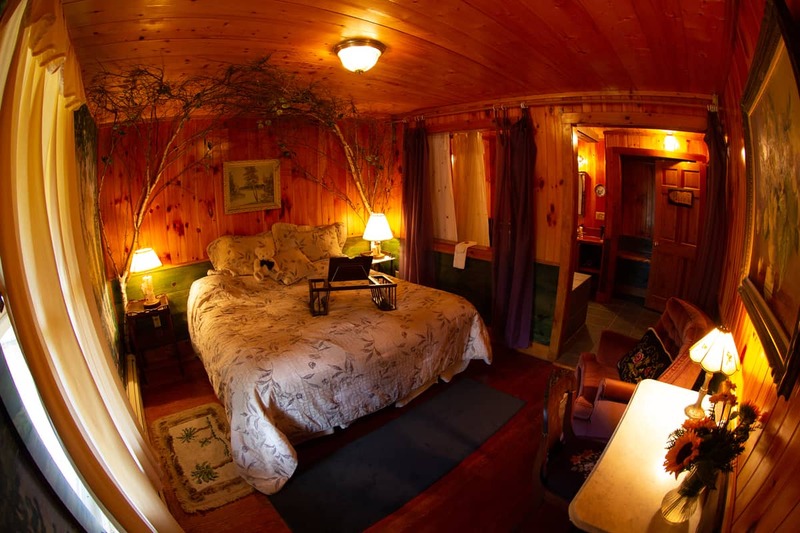 You will be staying in a piece of Adirondack'a that is rapidly disappearing: an original Adirondack Great Lodge. Within this our rooms have been meticulously restored by 3 generations of family, all with private bath and their own unique story to tell. 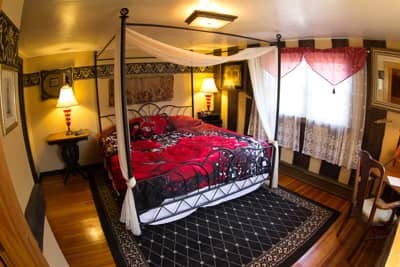 The is a cozy room with king bed and private bath. 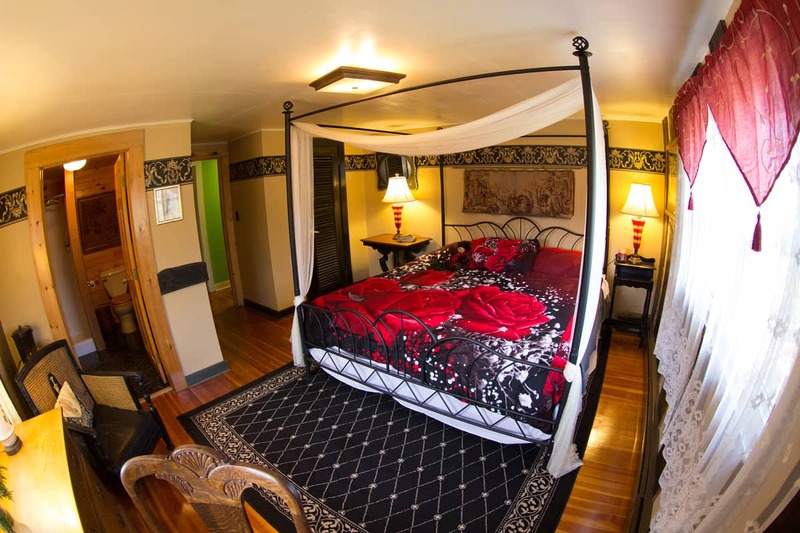 It features a unique painted mural and open bathroom configuration with curtains dividing the bathroom and bedroom. This room gives you a feel of our European Heritage. A King Canopy bed nestles you within its cozy down mattress.